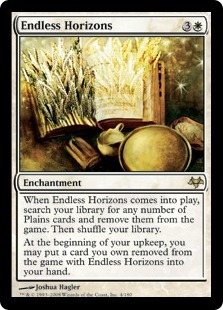 When Endless Horizons enters the battlefield, search your library for any number of Plains cards and exile them. Then shuffle your library. At the beginning of your upkeep, you may put a card you own exiled with Endless Horizons into your hand.